For your 15cms (6") Cards. The most popular size to make a card is just by folding the A4 card in half and creating your design. 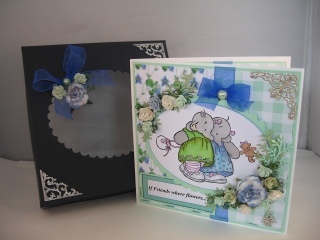 It is by far the easiest one to do, and the one that beginners to cardmaking most often start off with. I have included in the tutorials a short video on Making a box for that size of card. The next most popular thing we like to do is make square cards, by just cutting the A4 down. This video will show you how to make the smaller version of the box and how to arrive at the size you need to cut the card. Making a Card from start to finish. Then after a while we like to experiment and try different shapes and sizes and we need to know how to send them to the recipient safely. So this method can work for whatever size you make, but you will need to work out the card size and then allow extra, on each of the four sides, to be able to fold it in to make the box sides. The video is short and will show you exactly how making square boxes can complete the look to all your cards. 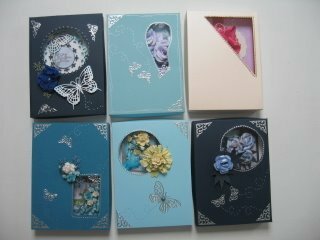 I hope you will try making these boxes so that your cards will have the professional look you like, especially if you are going to sell them and get a good price for the cards you make.